This powerhouse embossing paste has changed my view of embossing. I adore a tone on tone look and I also love a full embossed background to layer accents on. 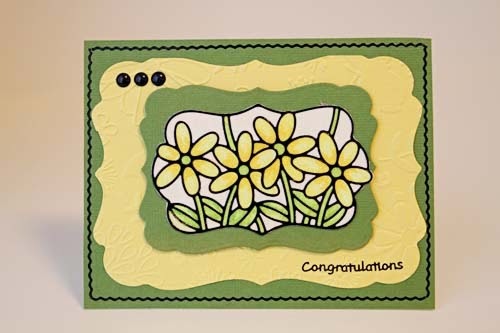 Well, this can be achieved in minutes with the Wendy Vecchi/Studio 490 and/or DreamWeaver Translucent Embossing Paste. Let me tell you a bit about my experience with this embossing paste. Firstly, it is easy to apply - just use a palette knife and spread a thin coat through a stencil of your choice. I let it air dry for about 5 minutes and then heat the embossing paste. Unlike the Viva Ferro paste, the translucent embossing paste feels somewhat rubbery after being heated and is quite flexible. It also cleans up wonderfully with warm water - no soap for this girl! Then a few passes through my Vagabond with the Wplus9 Happy Trio die and another finished card. 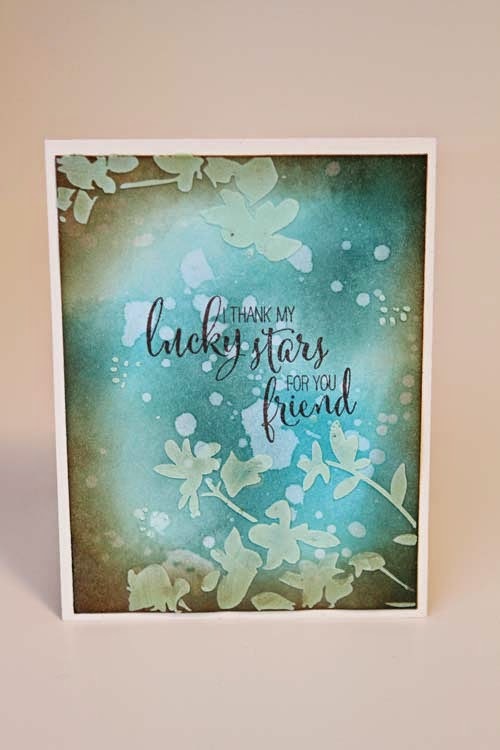 If you would like to take your translucent embossing paste to the next level, sprinkle embossing powder over the translucent embossing paste that you have applied through your stencil. Then heat and add your accents. 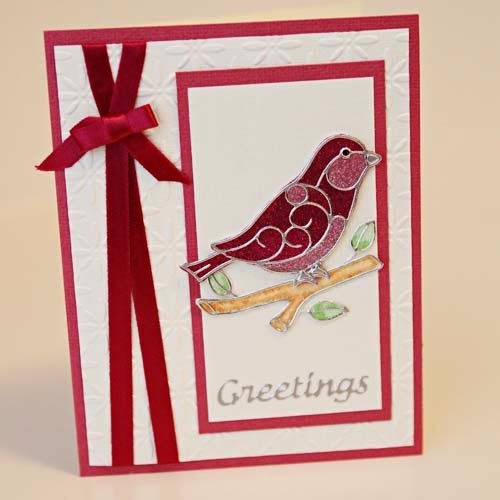 Here I used the Wplus9 Hand Lettered Hello die, available directly from Sandy. Elizabeth Craft Designs has a diverse line of stickers. When I say stickers, I mean beautiful intricate designs that become show pieces for cards, art journals and layouts. 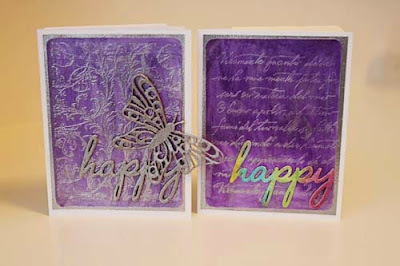 See these stunning samples made by Carolyn W. against dry embossed backdrops. These cards showcase the sticker, ultra fine glitter and copics technique. 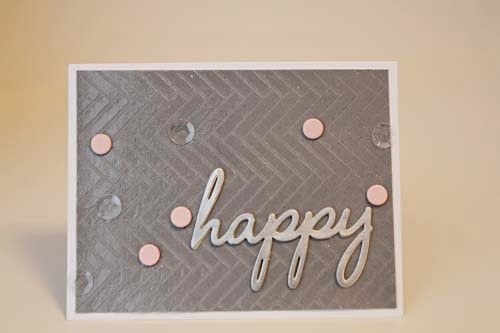 For our first card, the Darice Assorted Stars Embossing Folder is used to create the card background. 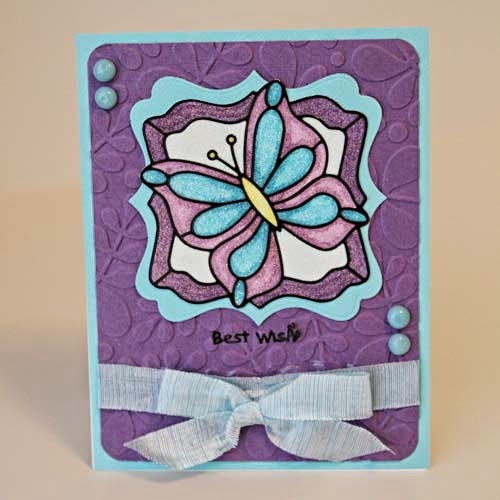 The Darice Floral Butterfly Embossing Folder is showcased on this card along with the Elizabeth Craft Butterfly Label 1 Stickers. 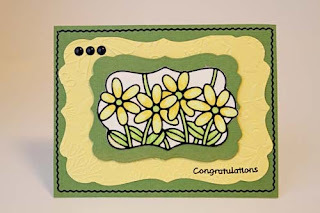 Flowers Label 1 in Black by Elizabeth Craft Designs is showcased on this card. It may seem early for Christmas but it isn't! Christmas supplies sell out fast. This versatile sticker by Elizabeth Craft Designs shown below is called Birds and Branches. 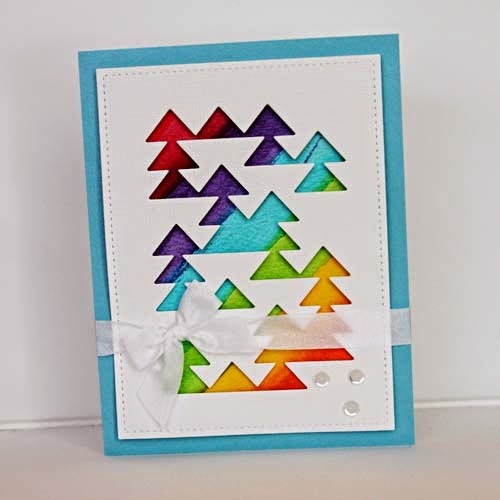 It can be used for Christmas but also as an all occasion or sympathy card. Don't forget that most Elizabeth Craft Designs stickers can be used twice as much as regular stickers. Why? Because you use the positive AND the negative of the sticker! I personally love them. The look of watercolours is all the rage now...and I understand why! There is a softness that prevails but at the same time, there is intricate texture. I idolize Amy Tan because she makes the watercolour technique look so easy, casual yet at the same time, elegant. You can achieve the watercolour look in a variety of ways. 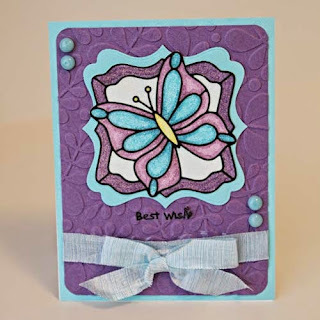 Connie V. (from our card swap) used watercolours and a Julie Nuttig stamp - you can order it directly through Sandy. 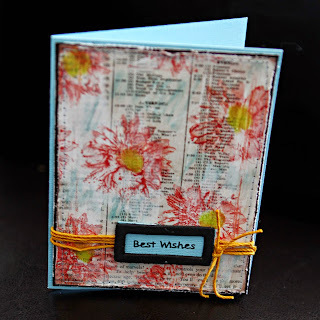 Don't you love how Lorraine M. achieved this look with Tim Holtz distress inks? 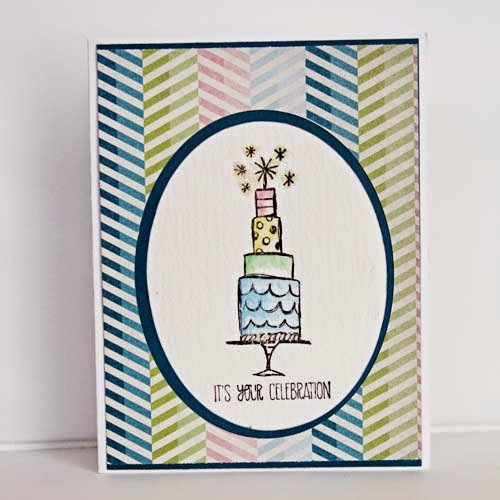 And for the card below, I stamped with my Faber-Castell gelato to achieve the soft watery look of watercolours. Have I inspired you to dabble with the watercolour look? I am very sorry it has taken me so long to post cards from Scrap Shotz's recent card swap; however, better late than never! Whenever I receive cards from the Card Swap, I am wowed by the creativity and then consumed with inspiration. I hope you will feel as energized as I was by these cards! 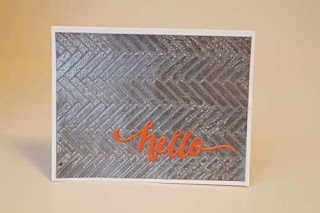 From Connie V. The multi-hued chevron background and the watercoloured look makes this a rather spunky contemporary card! Ellen Y. made this masculine card. The blue jean blues hint at familiarity, comfort and love for sure but that pop of red really captures the recipient's eye! Love this card! 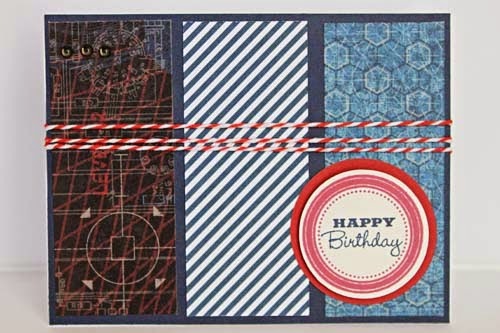 This card by Rosie N. showcases the My Favorite Things - Die-namics Peek a Boo Squared die. 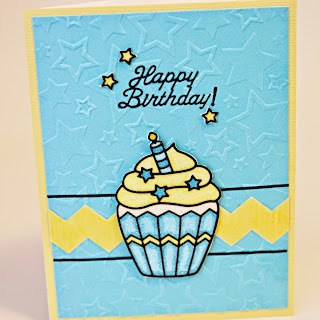 At first glance, you might overlook this uber versatile die but look how Rosie made this die into a shaker card? 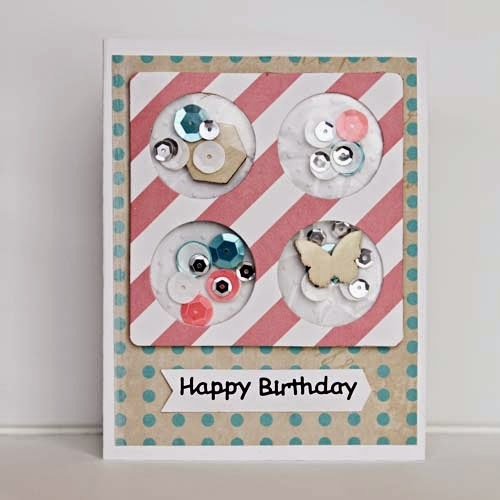 It is an exciting card for a birthday Boy or Girl! This card is so simple yet oh so stunning. 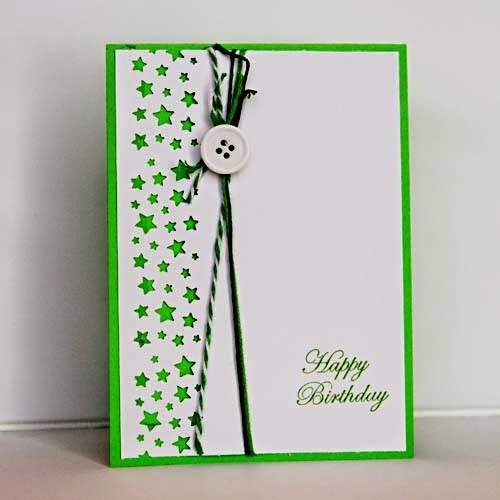 Using the negative of the star border die to show a bold green makes this card a show stopper! Awesome job Tammy L.! And this is my card, very much inspired by a Pinterest image I saw. I love the look of gold and silver together and dug into my Teresa Collins sequins from a recent Scrap Shotz monthly kit as well as some star shaped glitter. As well, I have serious love for the Wplus9 Happy Trio dies! I hope this blog post inspired you to create too - let me know! 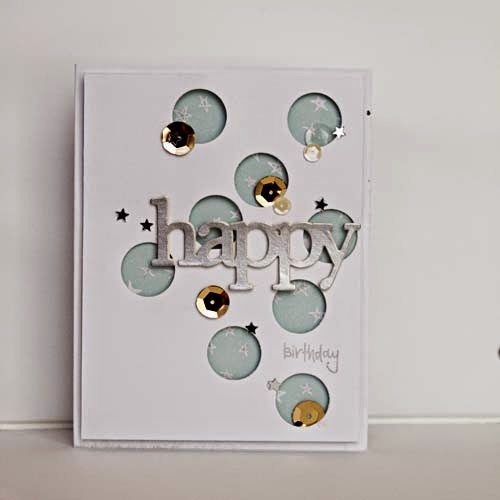 Want to make a stunning one of a kind card for a special someone super quick??? Try using Viva 3D Stamp Paint. 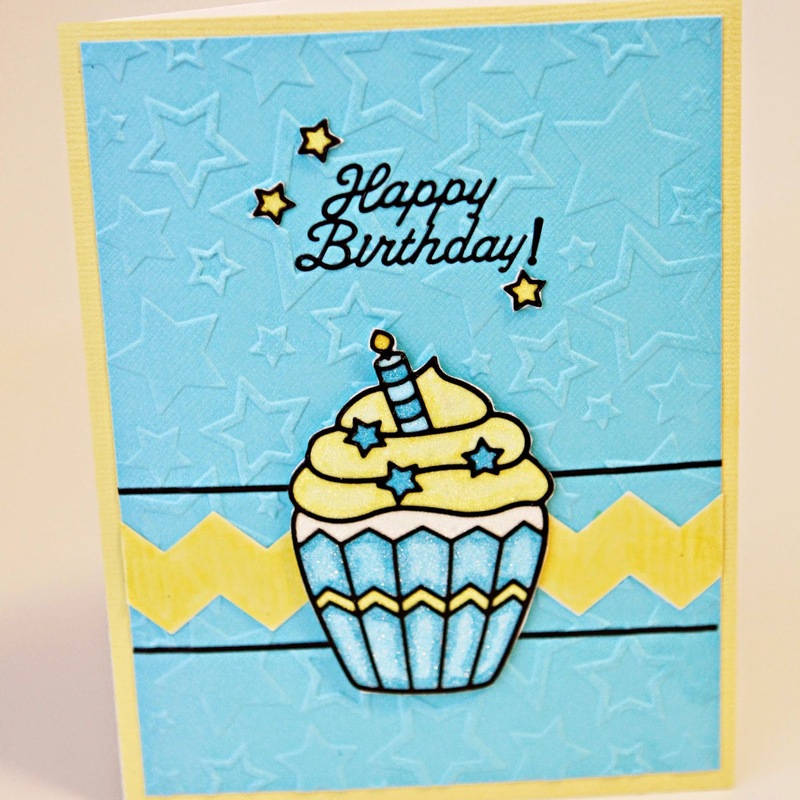 Viva 3D Stamp Paint adds a vibrant sparkly look to your project. It is both smear- and water- proof. I used a make-up sponge to apply the paint and used an almost dry baby wipe to clean up. 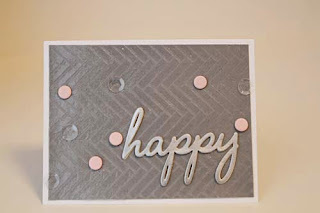 To make the cards below, I heat embossed a background stamp to cardstock. After the heat set embossing powder cooled, I used a small amount of paint (about the size of a pea) and rubbed it over the embossing. The embossing resisted the paint and created the cool effect below. It is hard to see in the photos but there are no areas of light and dark on the card front; its my picture taking ability, or lack thereof. To finish each of the cards, I added a "happy" from the Wplus9 Happy Trio die and an Elizabeth Craft butterfly die cut. Other ways I have used the Stampers Paint? Well, I have coloured wood veneers, flowers and die cuts. I have also used it as an accent in my art journal. Have you tried the Viva 3D Stampers Paint? I'd love to hear what you have used it for! I am still experimenting with it! Are you loving the monthly release of the Tim Holtz distress inks as much as I am? My creative juices start flowing whenever a new colour is released. With the Cracked Pistachio distress ink, I experimented with Peacock Feathers and Pine Needles for the majority of the background. To add interest to the background, I sprinkled water onto the background. It does not matter how many times I watch but I love how the distress inks react with water...it is so amazing! After heat setting the water reaction, I stamped the sentiment from a Wplus9 stamp set and inked the edges with Vintage Photo. 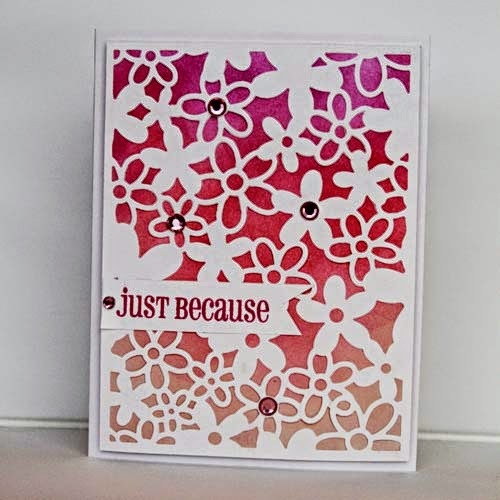 At this point, I thought the card was done but I looked across my desk at my new Tim Holtz Layering Stencil, specifically, Blossom. So I tinted Ranger Texture Paste with Cracked Pistachio distress ink on my craft mat and applied it through the Blossom layering stencil. Do you like this colour combination? Do you tint your texture paste? I'd love to hear from you! One of the hottest trends now is Ombré Inking. So what exactly is Ombré? Ombré comes from the french word meaning shaded or shading; that is, there are colour gradations moving from dark to medium to light. The colours can be from the same colour family or they can be from related colour families. This card has been previously posted as an example of Ombré inking using the Tim Holtz distress inks. There are dark, medium dark, medium, medium light and light sections. While it was rather easy to ink an ombré background using distress inks, Hero Arts has made it extremely easy to create ombré looks, be it a single stamped image or an entire background with their new Ombré ink pads. Check out the beautiful colours Sandy is carrying in the store: Butter to Orange; Grey to Black; Mint to Green and Pink to Red. 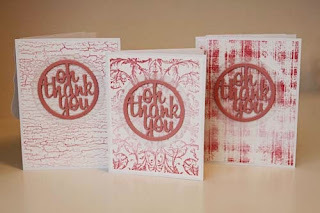 Below is a set of cards using the Pink to Red Hero Arts Ombré ink pad. 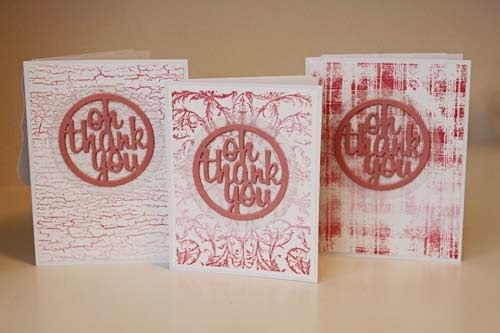 I love that rich texture Ombré inking affords to a card, accent or layout. As well, the Ombré inks dry permenant, are fade resistant on glossy papers and are waterproof for watercolours and markers. What do you think of Ombré inking?